It is said there are no permanent friends or foes in politics. Political rivals Congress and Janata Dal (Secular) who recently fought neck to neck to grab the assembly seat very recently joined hands to share the Ramanagara Zilla Panchayat office ! On August 27th elections were held for the post of President and Vice President of Zilla Panchayat. Out of 22 members Congress has 11 and JDS has 11 members each. The present zilla panchayat office has only 16 months to complete the 5 year term. According to the agreement between the rival political group the remaining tenure will be shared by both the parties. First the JDS will enjoy the power for 7 months and the Congress for the rest. Hence for the post of President JDS nominee Smt Nalina Navaneesh who represents Kasaba Constituency was elected unanimously. Congress nominee Smt Padma Krishna was elected as Vice President. Out of 3 sub committees the JDS will head one and the Congress will head 2 committees. After the elections both JDS and Congress party leaders came together in front of the press and congratulated the newly elected President and Vice-President. Leaders of both parties told the press that they joined hands to keep the communal parties at bay, which means the BJP. But the BJP has no presence at all in the Zilla Panchayat. Nor did the BJP proved its strong presence in the recently concluded bye-elections. 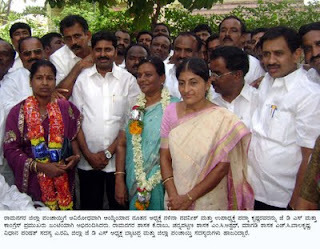 Just to enjoy the power in Zilla Panchayat the Congress and JDS has blamed BJP!